Arsenal legend Martin Keown has given a somewhat surprise name to manager Unai Emery for him to build his Gunners team around this season. 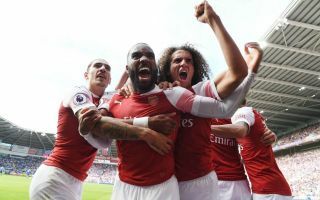 The former Arsenal defender says Alexandre Lacazette’s impressive display in the win at Cardiff City showed he should be a more central figure in this team. The France international was a little slow to get going at the Emirates Stadium last season, despite arriving with a big reputation after impressing at his former club Lyon. Many top players have taken time to adjust to life in the Premier League, and Lacazette looks a sharper and more confident player this season, despite having to make do with a place on the bench for the most part. Still, Emery handed him a start at Cardiff last weekend and he repaid that faith by scoring a superb winner and also bagging a classy assist for Pierre-Emerick Aubameyang earlier in the match. Keown was certainly impressed, and now actually seems to suggest that the 27-year-old should be a focal point in this Arsenal side. ‘How patient has that man been? His attitude has been impeccable,’ Keown said to the Daily Mail. ‘He failed to make the French squad for the World Cup then watched from afar as they went on to lift the trophy in Russia. ‘Emery used him as a substitute in his first three Premier League matches, then he finally gets to start against Cardiff. So what (does) he do? He goes and scores the winner. Should Lacazette be starting games for Arsenal?